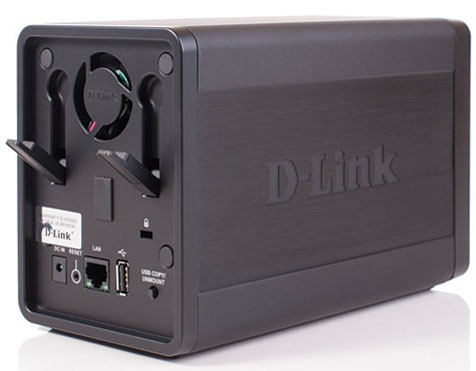 It's been a while since there was a review of some small and reasonably priced NAS for home or office users posted on our website; indeed, recently we have only been paying attention to professional rack-mounted SMB storages with function of mounting multiple discs. We must say that even at the moment there are several juggernauts waiting for their turn at our laboratory. 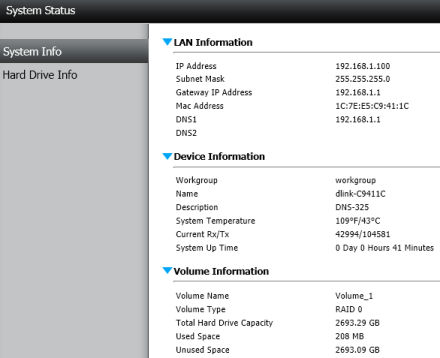 However, today we decided to make an exception and review a double-disk NAS D-Link DNS-325. By the way, it's the first time ever we test D-Link hardware making this day twice unique! 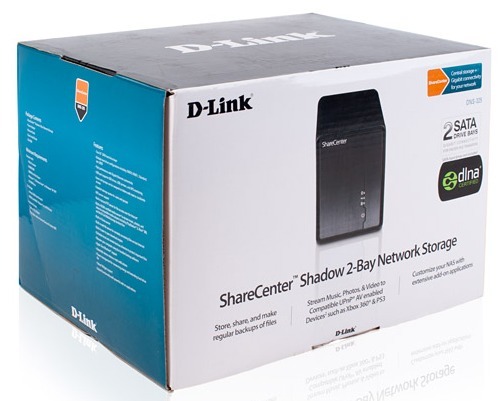 D-Link DNS-325 NAS is performed in a black plastic case with rounded corners and dimensions of 104x198x132 mm. Front and back panels are made of plastic. 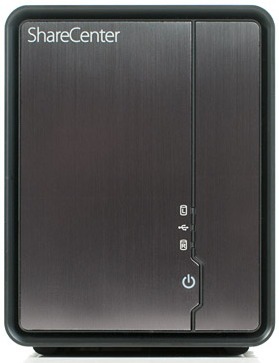 On the front panel there is a power button, USB port and LEDs indicating operation status of the two hard drives. 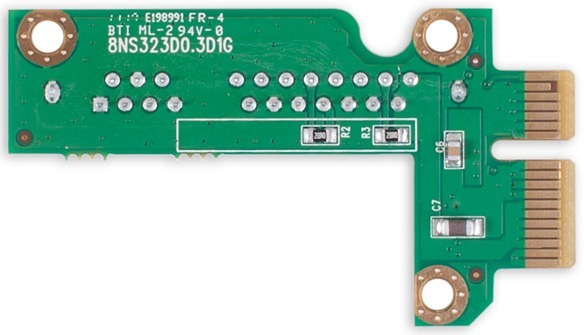 The front panel is detachable and covers disk mounting holes which you can easily extract using special levers located on the back of the device. 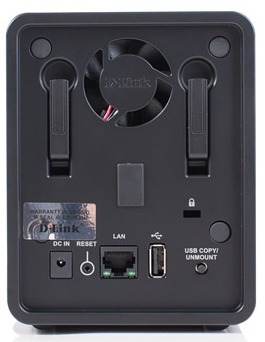 The back panel has a 40 mm fan, two levers for extracting the hard drives, Kensington lock, AC-power adapter jack, sunken Reset button, Gigabit Ethernet network interface, USB 2.0 port and USBCOPY/UNMOUNT button located on it. The fan running at full blast makes quite a lot of noise which is actually louder than the noise the disks make when they are on. 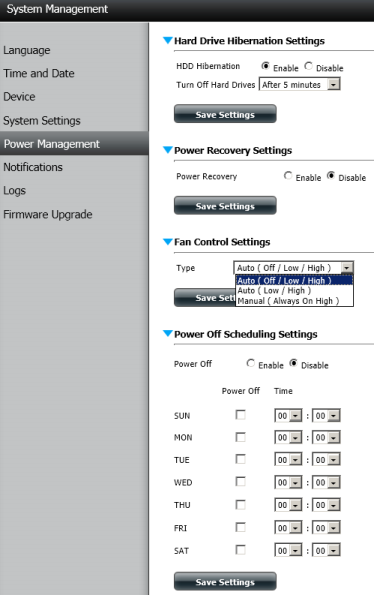 Fortunately, there is a feature that the storage web-interface has which allows turning the fan off when the cooling is not necessary. However, when the cooling system is on the noise it makes is pretty loud. Upper and side panels are not too remarkable and there is only a 3D brand nametag located on them. There are two rubber narrow feet going sideways the device and a sticker with brief information about the device located on the bottom. 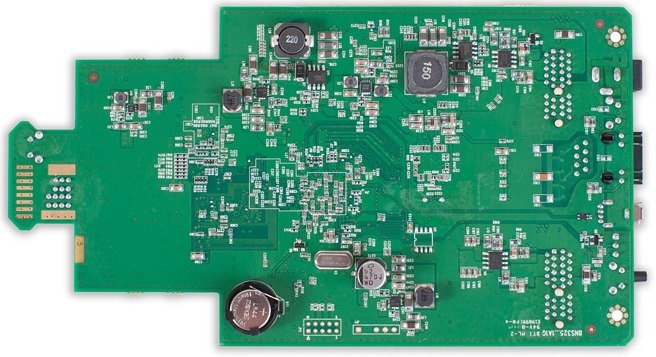 The power supply of the DNS-325 is provided by the 12V and 4A DA-48Q12 AC-power adapter. Now let's have a look at the insides of the NAS. Inside of the DNS-325 there are three green textolite cards and two of them act only as adapters. The most interesting parts on the main card are located on one of its sides. 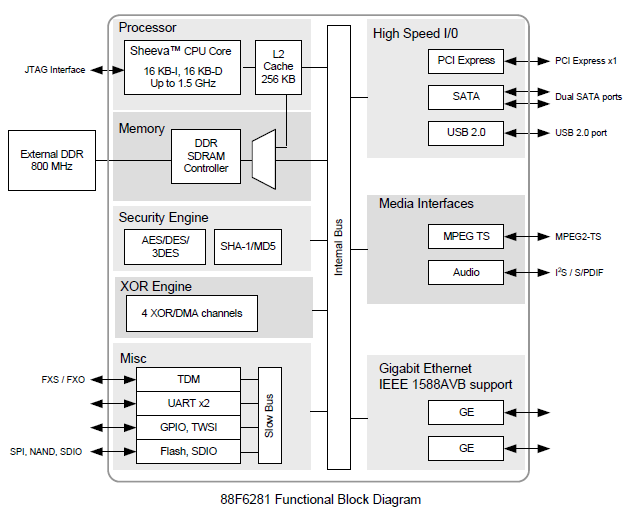 A Marvell 88F6-BIA2 chip, which runs on 1.5 GHz frequency, acts as the CPU, and its block scheme is presented below. 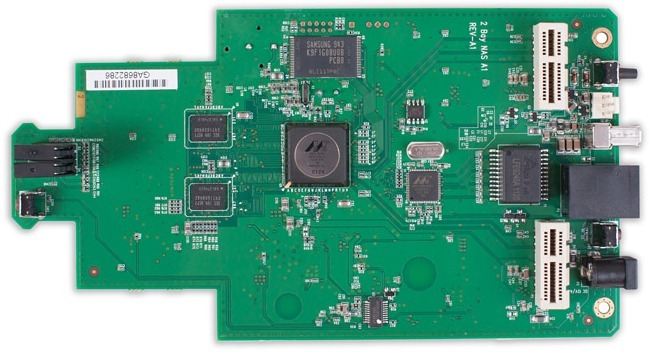 Network support is provided by the same-branded 88E1116R-NNC1 chip. 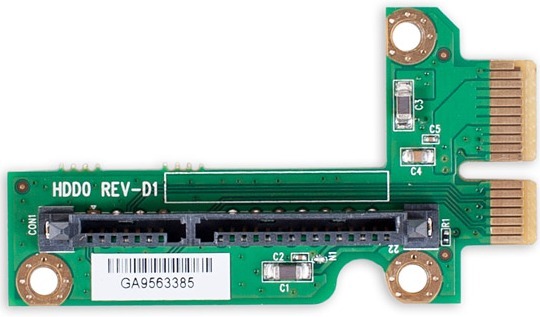 Flash memory and RAM are made by Samsung. K9F1G08U0Bс chip with 128 Mbytes of memory was chosen as the flash memory chip, meanwhile the RAM is two DDR2 K4T1G084QE units with 128 Mbytes of memory each, which makes the overall RAM size 256 Mbytes. Let's now pass on to reviewing the software of the device. 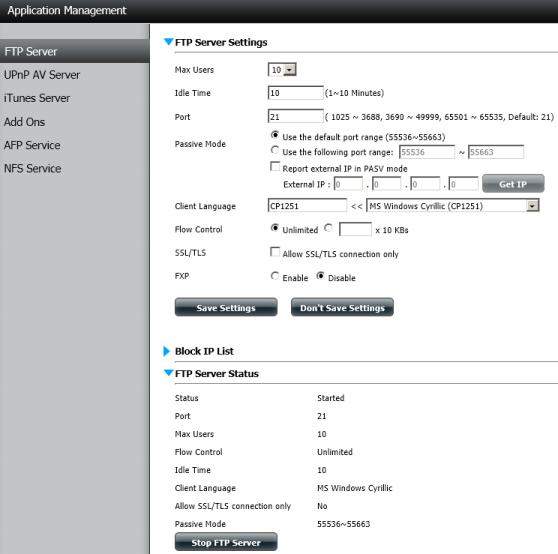 In accordance with the defaults, the DNS-325 must receive all IP options automatically using DHCP. 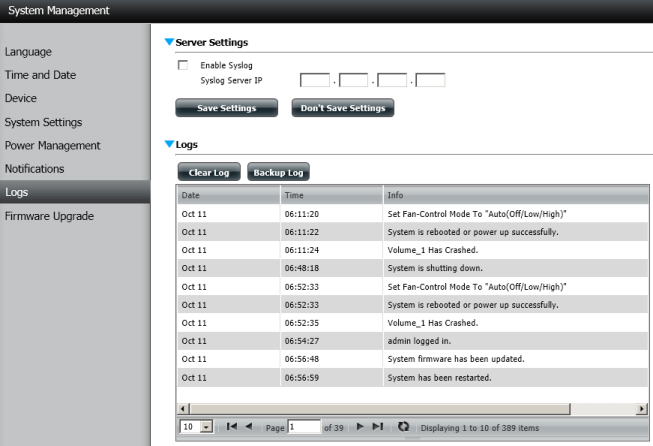 DHCP-server logs analysis will let us learn which address the NAS was assigned. 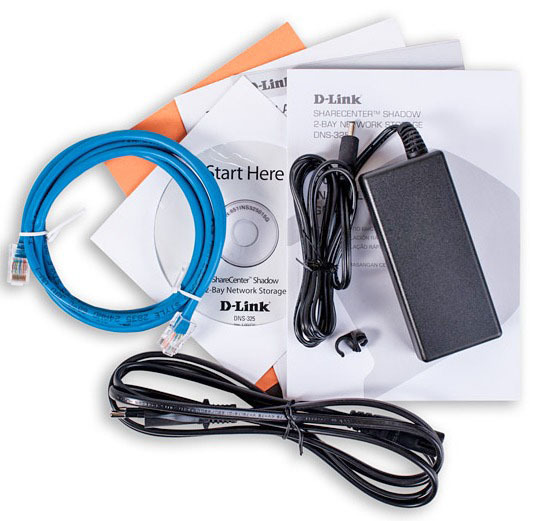 Since the method described above is not convenient for majority of users, the vendor suggests using a special utility called D-Link Storage Utility which allows an administrator to detect the DNS-325 in the net, set its network parameters, or skip straight to full-featured configuration using the web-interface. 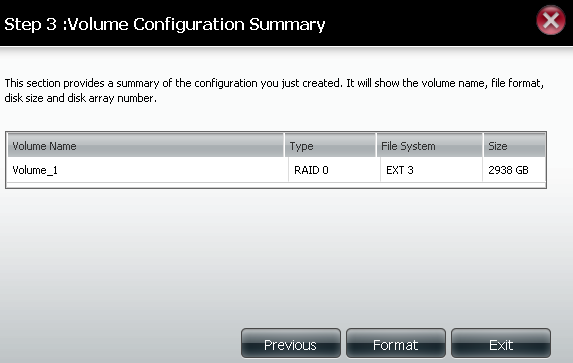 Also, this utility displays created RAID-arrays and allows connecting the remote disk space as a local disk. 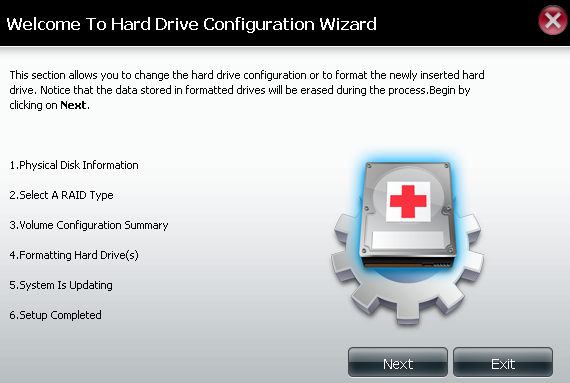 After all primary network settings are made, an administrator needs to enter Hard drive configuration sub-item, Drive configuration item, Configuration tab, where they will need to create a RAID-array type suitable for them. If upon creating the RAID-array there wasn't all disk space used, one can make the rest of free space available by creating a JBOD partition. After all primary network settings are made, one can pass on to updating the firmware and installing necessary language packs. 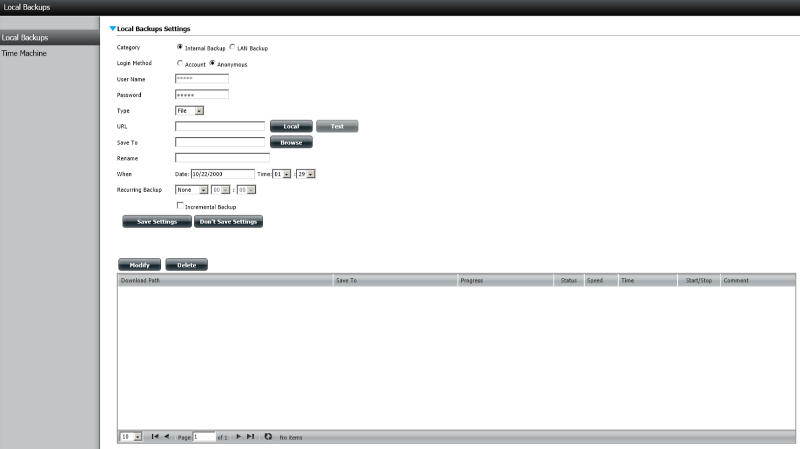 By default the users only can use English version of the web-interface of the DNS-325 and in order to add any other web-interface language one needs to enter Language item, System Management group, Management tab, where they will have to choose a language pack file previously downloaded from the vendor's web-site. After installation is finished, the necessary language must be chosen. 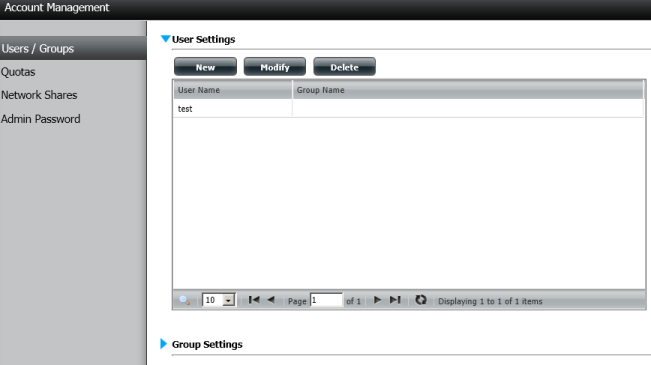 In order to update the firmware version a user has to enter Firmware Upgrade item of the same-named group. The firmware update process is as easy as the language pack installation, you only need to choose a previously downloaded file and the NAS will do the rest. 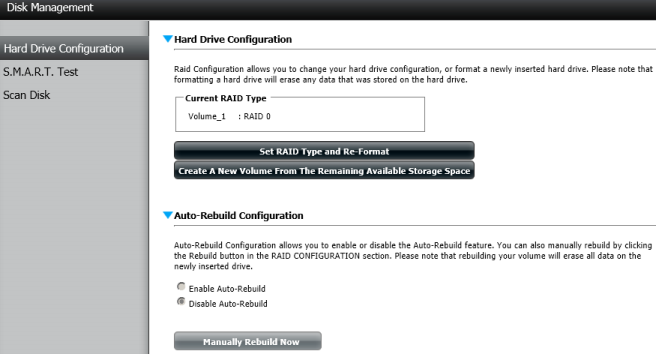 After updating, the NAS has to be rebooted. 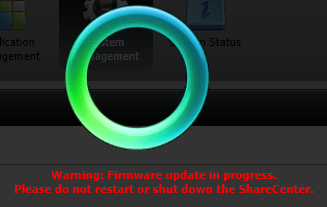 Overall firmware upgrade process takes around four minutes, the reboot included. It'd be fair to bring to the reader's notice the fact that language pack installation is available only when a RAID-array was created or disks were formatted and it's supposed to be done using web-interface in English. By changing a RAID-array type or formatting the disks the language set will be dropped and one will need to install language packs once over. Web-interface is easily accessed by any up-to-date browser using HTTP or HTTPs protocols. 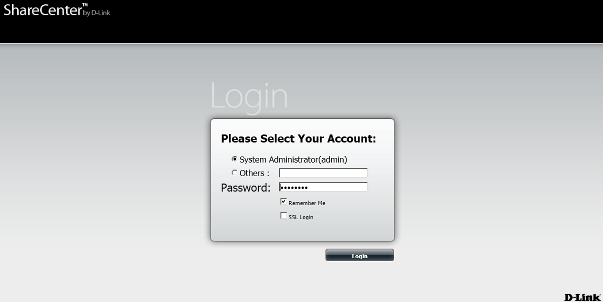 A login and password will be asked upon entering the system. By default one must leave the password field in blank. After typing in valid login and password a user will find themselves on the main page of the NAS where they can see their favorites, the storage status and all recent activities. Apart from My Favorites tab, an administrator has another two tabs called Applications and Management, and we are going to review them now. Using Applications tab a user will gain access to a kit of standard applications which can be used in order to carry out some sample tasks. If necessary, the list of applications can be expanded by adding on new apps. A user can make the storage download a certain file from an FTP or HTTP server by using FTP/HTTP Downloads app. 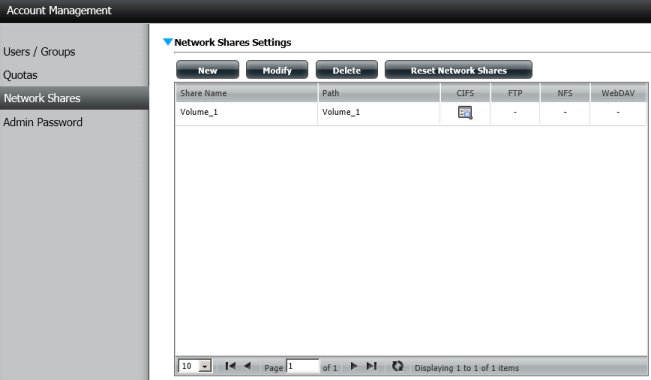 More to it, the DNS-325 has a built-in torrent client, that is to say it supports work in P2P networks via P2P Downloads app. 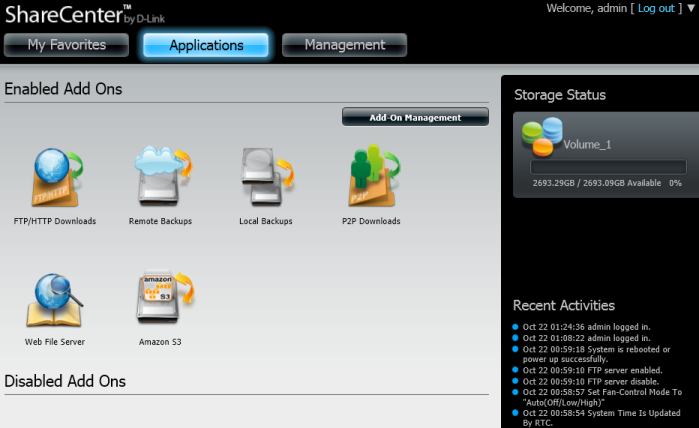 Remote Backups and Local Backups apps allow an administrator to carry out tasks involving remote and local backup of user data. It also stands to notice that using Amazon S3 app one can store data remotely on Amazon's servers, Amazon Web Service and Amazon Simple Storage Service. By using Web File Server app an administrator can gain access to the data which are stored using web-interface of the device. 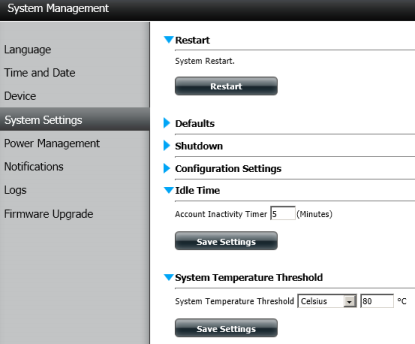 Items of Management tab will allow an administrator to manage the storage operation and its settings. 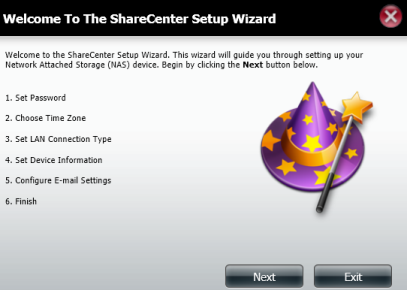 For example, using The ShareCenter Setup Wizard one can change the key preferences of the DNS-325. 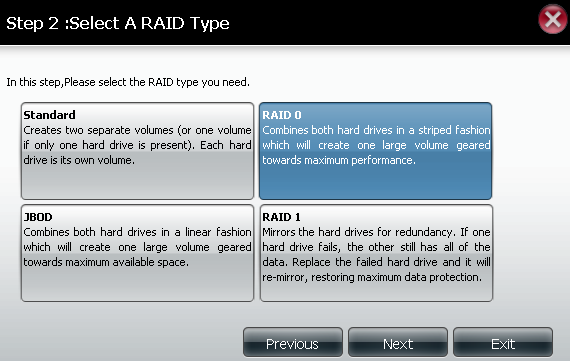 Disk Management item will provide an administrator means to manage a RAID-array, make S.M.A.R.T. tests and scan disks. 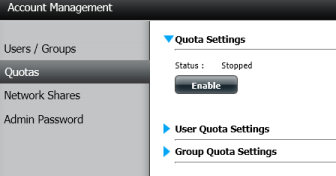 Managing user accounts and groups, disk quotas, network shares and administrator password change are made using Account Management item. 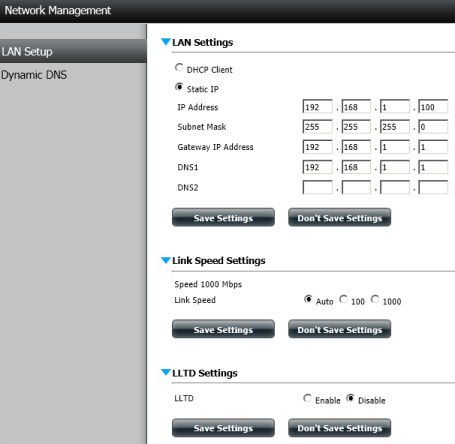 LAN Setup and Dynamic DNS sub-items, Network Management item, allow an administrator to manage IP parameters, link speed and LLTD and DDNS operation. Unfortunately, we couldn't discover support of IPv6 here. 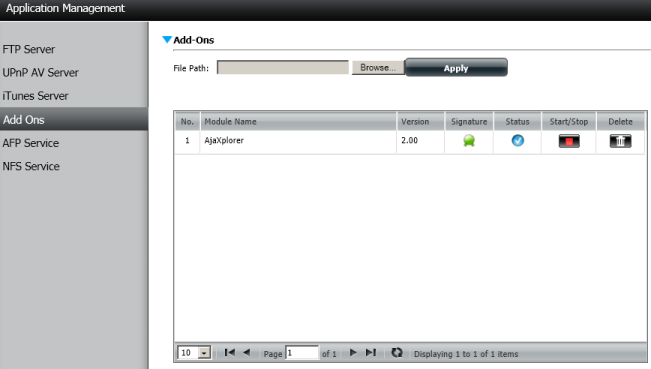 Application Management item is used in order to manage operation of file and multimedia protocols. 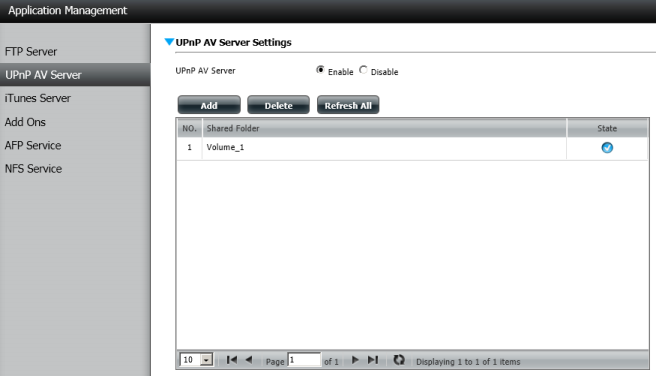 There are FTP, UPnP AV (DLNA), iTunes, AFP and NFS protocols among them. 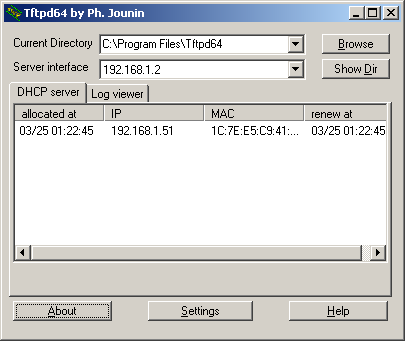 Besides using standard protocols, an administrator can add on new packs used to expand the list of connection means to DNS-325. Firmware update, language pack installation, changing date and time setting, user and system settings, manage power settings is made using System Management item. Amendments to the legislation of the Russian Federation concerning time zones and cancellation of day-light saving time have not been taken into account in the firmware version we used. 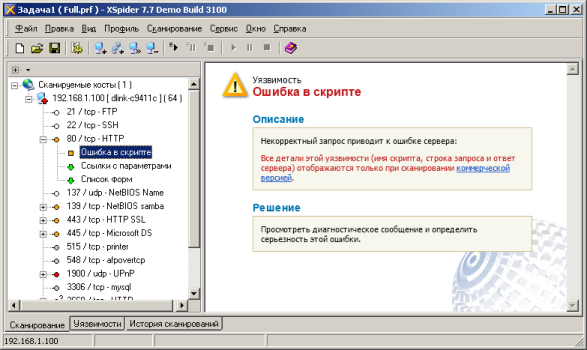 Moreover, we discovered that the system logs are not translated into Russian. System Status item provides all necessary and brief information on the system status. 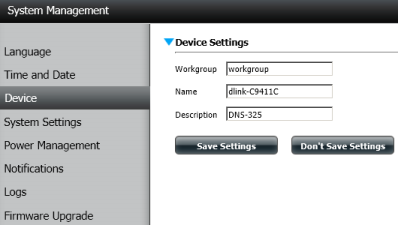 That's where we finish the review of D-Link DNS-325 web-interface and pass on straight to the testing procedures. The first thing we traditionally begin our testing section with is estimating the booting time of the device, which is a time interval starting with the moment when the power is on until the first echo reply is received through ICMP protocol. D-Link DNS-325 boots in 58 seconds, which as we consider, is a decent result. 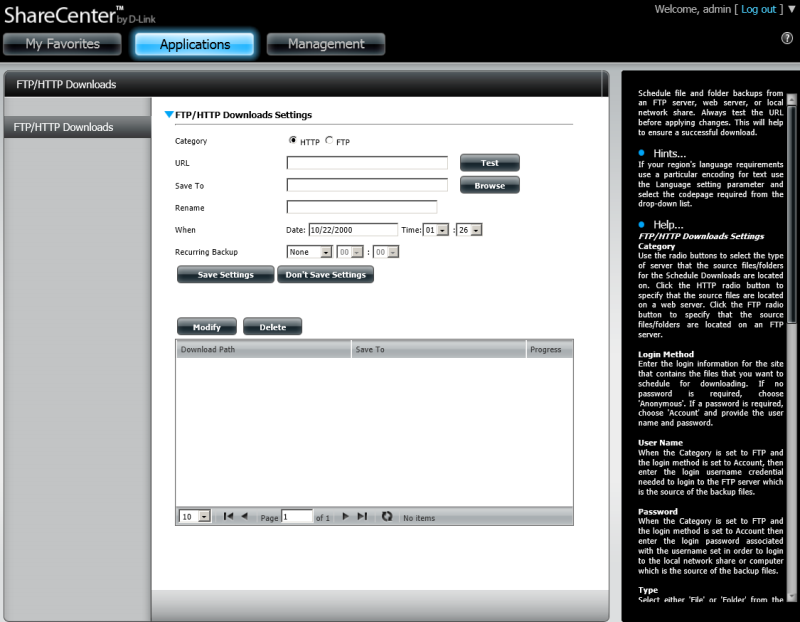 Using the Positive Technologies XSpider 7.7 (Demo build 3100) security scanner we tested DNS-325 right after creating a RAID-array and have discovered fifteen open ports, and they are TCP-21 (FTP), TCP-22 (SSH), TCP-80 (HTTP),UDP-137 (NetBIOS Name), TCP-139 (NetBIOS Samba),TCP-443 (HTTP SSL), TCP-445 (Microsoft DS), TCP-515 (Printer), TCP-548 (afpovertcp), UDP-1900 (UPnP), TCP-3306 (mysql), TCP-3668 (HTTP), TCP-6000 (HTTP), TCP-6882 and TCP-54068. The most interesting data are presented below. We think that the vulnerabilities detected are not critical. Since we discovered a TCP-22 (SSH) among the open ports, we decided to get connected to the storage using PuTTY, but unfortunately after having connected and typed in the login and password we received only a brief hello message from BusyBox and the storage itself gave no answer to any command. 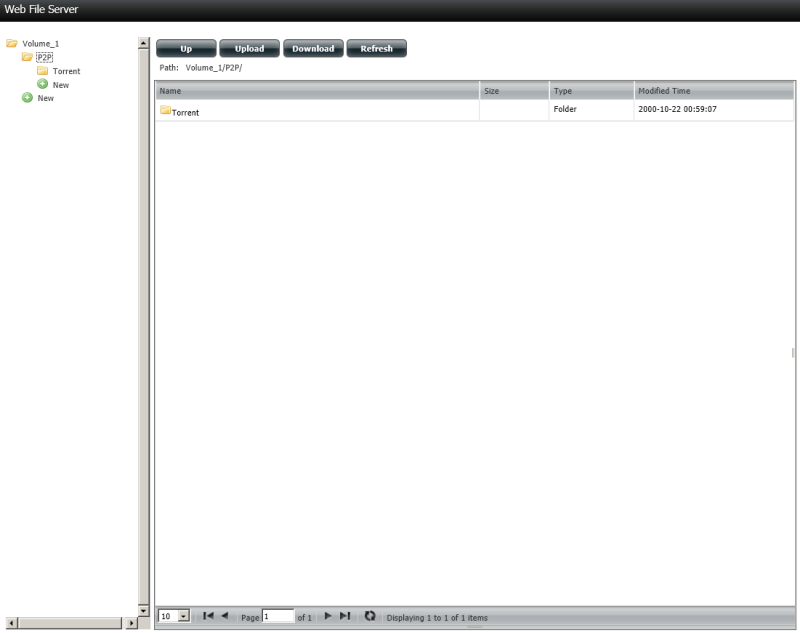 According to what the vendor says, the access through SSH is only to be used for office use by service engineers. Since many users of the DNS-325 will be using it in order to store music, films and photos to play them on TV or home cinema, we also decided to test some multimedia functions of the device. 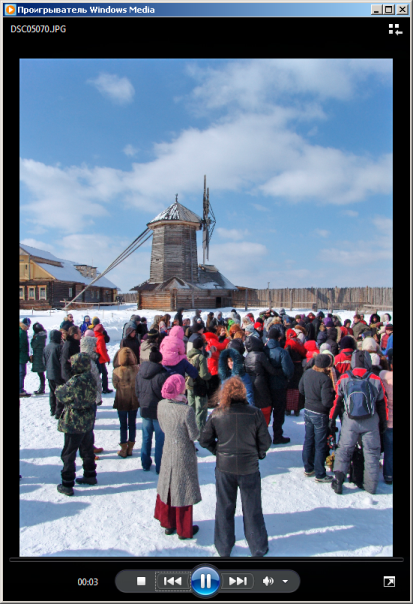 In order to do that we copied photos and videos from our Saturday trip to Slavonic Kremlin in the south of Moscow region. There have been no problems with connecting to the DNS-325 using Windows Media player and Windows Media Center and we have successfully watched our new photos and videos. The most interesting test we have made is, probably, a device performance test. 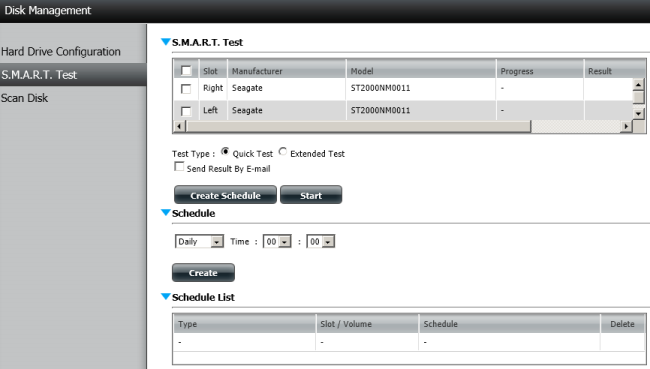 In order to do this kind of test we used Intel NASPT 1.7.1 utility. We created three RAID-arrays and checked access speed of the disks when used separately by the storage. The results are presented on the diagram below. 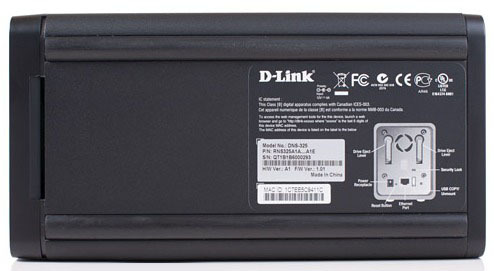 D-Link DNS-325 allows connecting external hard drives to its USB 2.0 port. We connected the Transcend StoreJet 25M3 external hard drive and measured the access speed to the data stored on it using Samba. 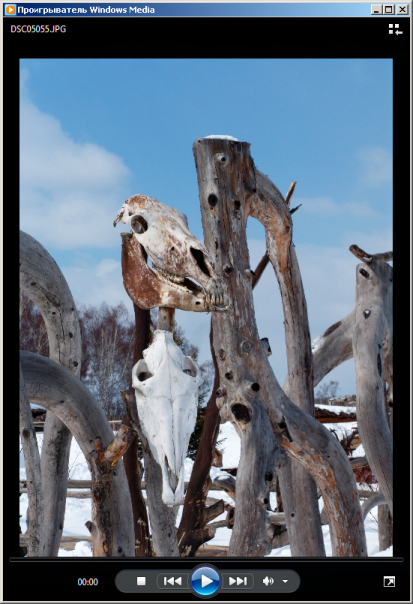 We can't help but mention the specifications of our test stand. 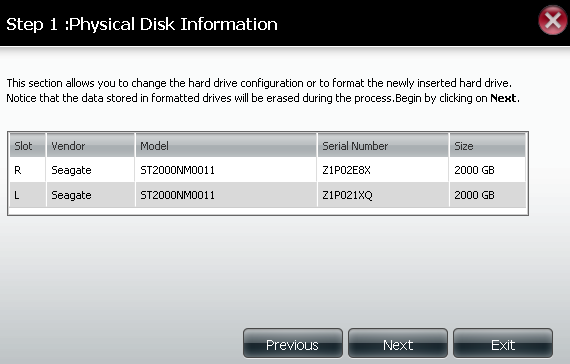 Hard drives Seagate Constellation ES ST2000NM0011 were used for our testing procedure. 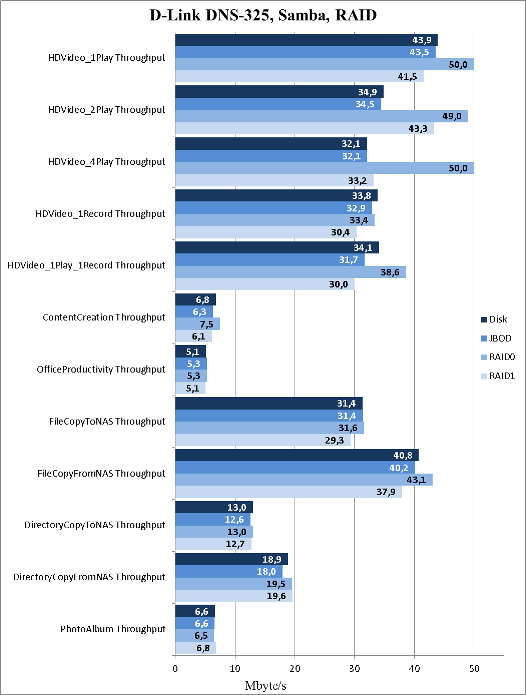 Before the performance test we have intentionally decreased the available RAM size to 2 Gbytes according to Intel's suggestions in order to reduce the effect of local caching. Also, we decided to set the operation speed of an add-on, called AjaXplorer that allows working with remote files using the browser. We installed the necessary plug-in and tried to upload our favourite video to the storage, but unfortunately the only thing we received was the error report. 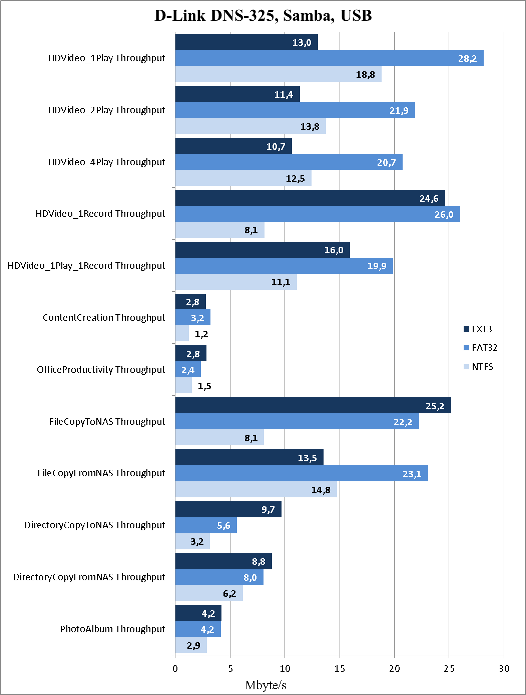 AjaXplorer doesn't support files which size is more than 2 Gbytes. We also tried to upload smaller files. The upload speed was 39.8 Mbytes per second. However, when the uploading procedure was finished we couldn't find the uploaded file in the storage. That's where we draw our testing section to a close and are summing it all up. 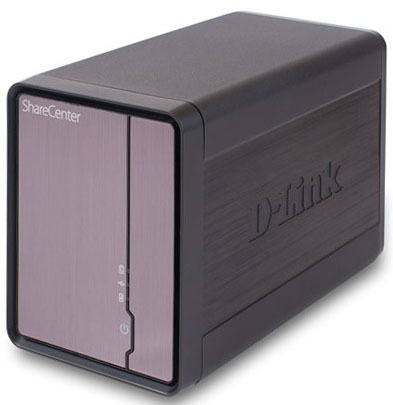 We have been left a bit mingled by the D-Link ShareCenter DNS-325 network storage for home users and small offices we tested. On the one hand, the storage performs high data transmission speed and its design is nice, but on the other hand there is some feeling that the software was left undone. Also, a small fan of the device is not a positive sign for sure. We believe that the presence of an HDMI port (as in Thecus N8900) in network storages of the same kind would greatly expand the applicable scope of the DNS-325 and not make it too expensive. All the drawbacks we have discovered are presented below. Of course we just can't help saying a few words about the strength areas of the device. As of when this article was being written, the average price of a D-Link DNS-325 in Moscow online shops was 4900 roubles. 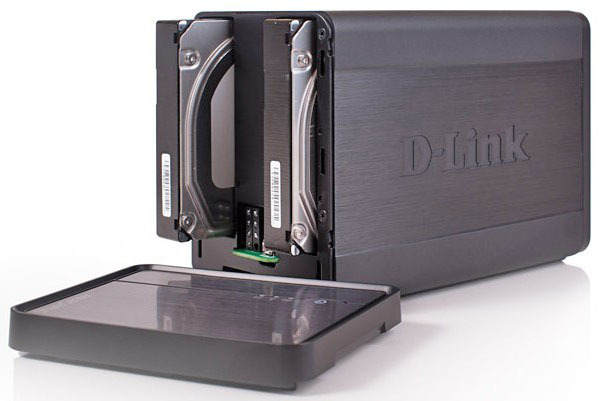 The author and editorial team return thanks to a digital store DNS for kindly furnishing us with the D-Link DNS-325 network storage for its further testing.